She left to talk to a group of people, could not tell if it was male or female, but probably male. This means that I was boring @NightNas (what a Twitter Handle?) - I mean, I was in the middle of telling a story which should have been exciting. 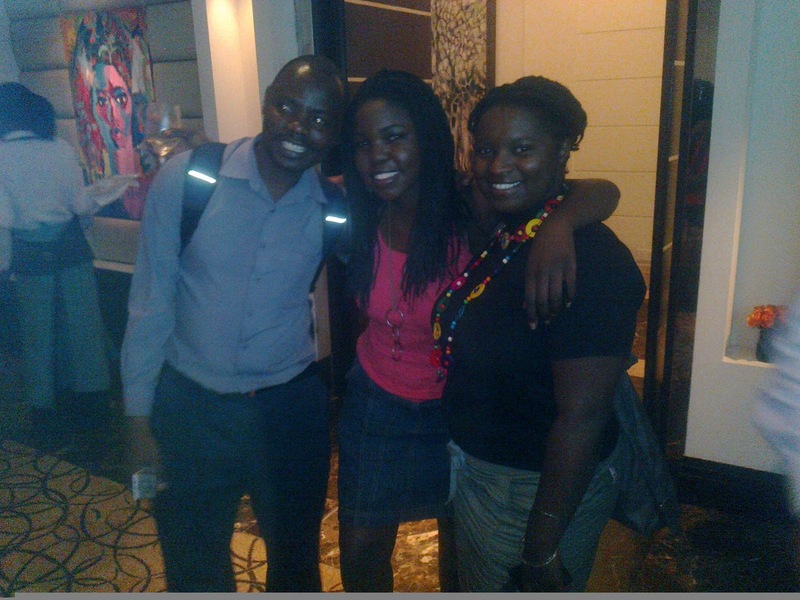 I blame it on @mwirigi , see, @NightNas had earlier been sandwiched between me and @julietwambui . @NightNas was the prettiest girl in the room, @julietwambui was receiving a lot of male attention , a guy would leave to be quickly replaced by another. I had spotted the two together, with no male presence on the couch. It did not matter that I was just from bidding @bankelele and others a good night and was leaving when I spotted the two and could not resist the invitation to join them. As I was saying earlier, I had been successful in joining and boring the two until @mwirigi called @julietwambui to join him on the couch he was seated on. A few minutes later, he called me into a conversation that I could not remember, and it is at this moment when I was distracted that @NightNas chose to leave. I had also bid the wild and former campus mate, @bobbui, a good night. The wildness extends beyond her green nail polish and her short hair which had been twisted such that her head resembled short bushes strewn over a Savanna Grassland. I shall not mention what drink she was having. I had been a great night. Earlier on I had spotted @Buggz79 on the dance floor, part of the only pair that had felt fit enough to drop a few moves. I had not talked to the lady and therefore had no idea of who she was. I had earlier had a discussion with @Buggz79 on the the airport, and his employer, Kenya Airways. It is not a conversation that @ArcherMishale would have proved, he had pointed out that Friday evenings were meant for fun and loosening down. @gitts, who I had earlier discovered went to the same high-school that I was later to join years later, had mentioned to @Archermishale that it was a habit that we often discussed business and weighty matters in and out of clubs. 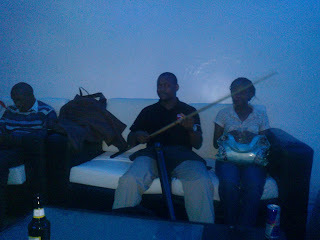 It was I who had been interested in what high school that @gitts had been, a question I was later to ask @julietwambui. I had been reading @gitts blog when I realized that his behaviour was common in alumni of a few schools. When it came to alumni, @gitts had company in @kachwanya and the sly @iddsalim. A few hours earlier, when I had walked into Secrets Lounge for the July Bake, there had been only a few people. @iddsalim was one of them, with a lady by his side who seemed deeply captivated in Idd's fine words. I would later spot him with other ladies who looked even more keen in his words. @PhilipOgola was also among the early arrivals, and so was @Juuchini and @techweez who pointed out that @bobbui had bee talking to him without them knowing each other . 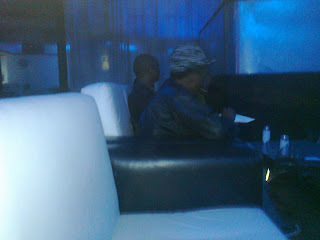 It was also my first and only opportunity so far to meet @Wamathai , who soon left for @ngwatilo's concert. I pointed out to @wamathai that it had been a great three days for my life in literature. 24 hours earlier, Yvonne Owuor had moderated a panel in which I had been dwarfed by Gado and Makutano Junction producer, David Campbell. 48 hours earlier , it had been Claudette Oduor, popularly known as @soul_fool, she who will such a great literary height to be ranked along side the likes of Chinua Achebe, Ngugi wa Thiongo and Chimamanda Ngozi. I later spotted @soul_fool in the midst of her lady friends. They were later to be joined by @Mwangy, though I had avoided to ask his name because my memory is fond of failing myself. My thinking though makes up for my lack of memory, a fact that helped me get through primary and high school, only to find campus lecturers who could not think and therefore graded you on you ability to remember what they have remembered over several decades. At some point, I had talked to @kahenya, a guy I was once told is the champion of bragging at Nation Centre. Kahenya is the guy behind the Bloggers Association of Kenya (BAKE) platform and is now working on an advertising channel for BAKE. He is also among the people behind Zuqka and has worked at Sony's PlayStation division amongst other stuff. @kaboro, the guy who oversees operations at the geek tech Skunkworks mailing list mainly out of his pocket and time. He was pissed at paying ksh. 200 for a few hours parking. I nodded , I did not tell him that I was equally pissed that Tusker Malt sold at Ksh 50 more than Tusker Lager despite the manufacturer selling both at about the same price. @kachwanya, who manages BAKE , walked me out as he told me of the great times that await Bake. I pointed out to @archermishale and his pal that holding conversations at the entrance to the loo , though quieter than the club, was a bit awkward. @savvykenya had made me promise to attend this month's edition of the BAKE meetup, and had even convinced me to foot what would have been her bill. She was absent though, attending to her grandfather's funeral. Drinks were also on Africapoint, the tours and safari firm that is also running a corporate social responsibility programme that donates seedlings based on the amount of Blog and Twitter based conversations on the cause. It is also @savvykenya who normally does such a post, albeit in a better way, I am just a copy cat, just like the many stalls in Nairobi streets that look like and offer the same commodities as the stall next door and the next one.